A contribution accounting system is not a currency and not a barter system. It doesn’t refer to an exchange between individuals conducting joint work, whether picking cherries or on a project, or between them and another entity like a company. They are not getting paid a salary in exchange of their work. They are collaborating, they all add cherries into the same basket, which is their product to be. The exchange might occur at a later point in time, once their basket is full and ready to go to the market. Meanwhile, they all share the risk of having their cherries being eaten by birds, or of not getting a good price for their basket. stigmergic coordination– Participants don’t have aligned goals, don’t maintain a relationship other than being contributors to the same process. Ex. this is how Wikipedia is built. cooperation – The goals of participants are not necessarily aligned. Ex. in a corporation employees and business owners usually have divergent interests and goals. collaboration – Requires a large degree of alignment in goals. Ex. a group of individuals climbing a mountain together. The traditional capitalist economy is mostly about cooperation, which doesn’t require an tight alignment of interests and goals. Production is sustained through an exchange process, where workers exchange the time they spend on different tasks against wages. The exchange process transfers risk from workers to the owners of capital, but at the same time, the workers are stripped of their rights to the output of their labor. Workers cooperate (despite some inconveniences and misalignment in interests and goals) with the owners of capital in production processes because there exists an economic dependency between the two groups. Workers need money, which are by far the predominant means to acquire basic necessities. On the other side, the owners of capital need labor to generate more wealth. This economic dependency is not symmetrical and makes the system prone to abuse, which explains the existence (and necessity) of unions to counterbalance the tendency for exploitation. In peer production we have a blend of the 3 arrangements mentioned above, mostly coordination and some stigmergic collaboration. In general, no one works for anyone else. Everyone involved is a peer, an affiliate of a peer production network. The p2p culture prescribes that the output of a collaborative and participatory process should not be owned or controlled by anyone in particular, but shared among participants in a fair way. Immaterial artifacts that are produced in such way (such as software or hardware designs) are usually released as commons (they are openly shared). Material goods can be exchanged on the market, and the revenue generated is shared among all the participants. Service-based models also exist, where services are exchanged on the market against some form of payment, which is redistributed to everyone involved in the providing the service. A good example of service-bases p2p model is the Bitcoin network. If we focus only on the mining aspect, minors form a open network of peer participants, they collectively maintain the hardware infrastructure of the entire network. Miners are rewarded in proportion to the computing power that they provide to the network. In the traditional capitalist economy wages should be regulated by the free labor market, if we make abstraction of all sorts of mechanisms through which this market can be biased (labor unions and governmental intervention included). The market is responsible for the difference in salary between an engineer and a clerk. The notion of job implies that a salary is determined and agreed upon before the employee starts working (with the possibility modify the salary based on performance). Since the amount of $ per hours of work is pre-established, the capital owner needs to make sure that the employee produces enough during the work hours. Therefore, a new role is needed within the organization to guarantee this, the beloved project manager. Traditional organizations spend a lot of energy doing time management, because usually the interest of the worker is not perfectly aligned with the interest of the capital owner (see cooperative production above). Classical organizations operate on the normal mode of production (from the ”normal curve” or ”bell curve”), where the number of workers is minimized, and the majority of employees in a category of roles produce almost the same amount. Very few workers produce less than the norm, because they are eliminated (i.e. fired). Very few produce more, because there are no incentives to do so, the association with the mission of the traditional enterprise is weak, the sense of belonging is usually low (usually fabricated by the HR department), the sense of ownership is almost absent, etc. 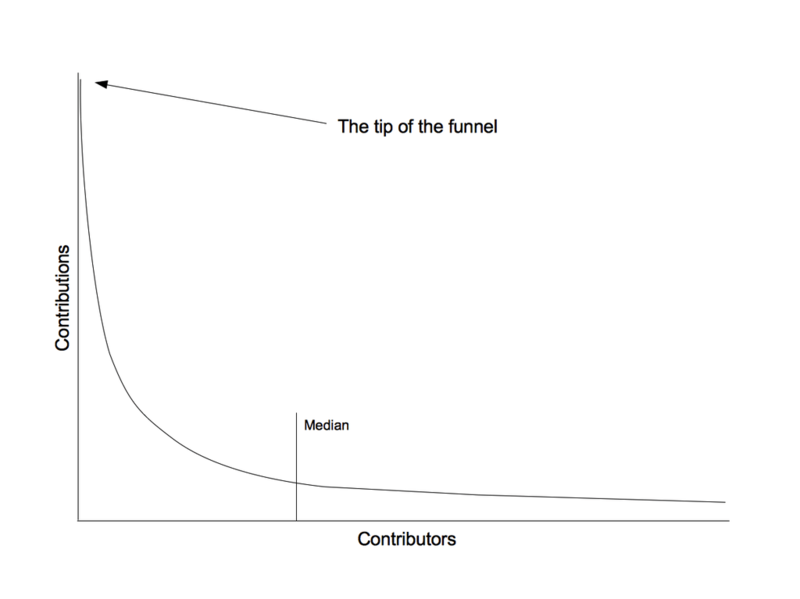 In peer production, we see a log tail distribution of contributions, which means that a very large number of individuals are involved in production, only a very small percentage of those contribute a lot, the great majority of them contribute very little, and most of the production is done by those who make small contributions. A prearrangement on revenue is impossible in this context. First, because the production process is very dynamic and relations of production cannot be contract-based. Second, the process involves a great number of individuals that are distributed all over the planet, therefore it is impossible to do time management. Moreover, no one can force anyone else to work more. In this mode of production we need to evaluate rewards after the fact, based on deliverables or based on the type of activity and its potential to increase the probability of production of valuable products. A system is needed to account for everyone’s contribution, to evaluate these contributions and turn them into rewards.We call this an access to benefits algorithm. As the economy transitions to a networked state, existing organizations are trying to adapt. We already see traditional corporations going from in-house R&D, to outsourcing R&D and more recently to crowdsourcing R&D. This movement is forced by the need to innovate fast, and by the fact that open source lowers the price to a point where traditional high-tech corporations can be put out of business. Crowdsourcing R&D means utilizing all sorts of schemes to attract the participation of the crowd into innovation processes that are sponsored by these corporations. In early crowdsourcing practices corporations tried to control the innovation by signing non-disclosure agreements with the participants. Crowdsourcing platforms were created to match corporate projects with skilled individuals. The practice was competitive, i.e. the company would chose a winner among different proposals, and usually the winner was rewarded with money. This practice gradually became more open, since the first iteration of crowdsourcing platforms were not very successful in attracting highly skilled individuals. In order to attract innovation, in order to grow open innovation communities around them, corporations need to think seriously about the reward mechanisms they put in place. It is not so difficult to understand why the early crowdfunding platforms were not very good attractors. I would not compete in a call by a company to design something for a few bucks, with a good probability of losing the race, knowing that the company will monopolize the work and probably make a lot of profits on it. The trend is to go from closed crowdsourcing to truly open source innovation, which must be accompanied by a broadening of the reward system. Since companies are going to deal with the crowd more and more, they need a contribution accounting system to account for contributions. See this presentation by SENSORICA making the distinction between competitive crowdsourcing and collaborative crowdsourcing. On June the 11th, 2015, SENSORICA co-founder Tiberius Brastaviceanu was invited to the White House, Eisenhower Executive Office, to discuss the open value network model pioneered by SENSORICA. Hosted by Jenn Gustetic, Assistant Director for Open Innovation, the focus of the discussion was around collaborative crowdsourcing models and interfaces between open communities and traditional institutions. SENSORICA’s open value network, or ‘OVN model’, with its network resource planning and contribution accounting system (NRP-CAS), allows collaborative crowdsourcing at large scale. The system allows people and organizations to collaborate on the best possible solutions by rewarding them fairly in proportion to their contribution. This stands in contrast with the XPrize crowdsourcing model (used by NASA), which produces one solution as a result of a competition, instead of capturing the value of collaboration and leveraging the work of the cohort. The White House is looking into how to make open communities and networks play a more efficient role in our society. Since the advent of the Internet there is a growing role for open communities in culture, education, and innovation. Open source hardware communities are driving industries like 3D printing and consumer drones, which are both groundbreaking technologies. SENSORICA is a working model in the evolution of open source communities, with infrastructure, methodologies, governance and legal structures adapted to bridge the model to traditional institutions. The open value network model makes SENSORICA a viable, reliable, accountable and auditable open source community. We used the following slide deck as a visual support for our discussion.